I hope the relearning of the English alphabet has been as much fun for all of you as it was for us. As we come to the last letter in this journey, I picked up a very flavorful and rich paratha fit for a Nawab. Zafran means Saffron and so the flavor infusion was saffron in this paratha and I loved the way the layers were incorporated by the rolling of the dough in a unique pattern. Please refer to the pictures for more clarity. I shall publish another post to recap all the flatbreads which were showcased in this series. So watch out for that. Thanks to Srivalli and the rest of my BM friends who accompanied us in this journey. Soak saffron strands in warm milk for about 30 minutes. In a mixing bowl, add wheat flour, salt, sugar, oil, half of the saffron milk leaving the strands in milk for topping/garnish. Knead well while adding yogurt to make a soft dough. Make 6-7 portions of the dough. Roll each portion into a six inch thin disc using as much dusting flour as needed. From the center of the disc, make a cut to the edge of the disc. Press down the flower shaped rolled disc and roll again using as much dusting flour as needed to a 5 inch disc. Brush the disc with the saffron milk with a few strands on it. Gently transfer the disc onto a heated griddle with the saffron milk side on top. Cook well and drizzle ghee/oil as needed on both sides and make sure both the sides are cooked well. Remove onto an insulated container and continue with the rest of the dough. Serve with a spicy accompaniment. For the letter 'Y' I have chosen to highlight 'Yerra Gummadi' which means 'Red Pumpkin in Telugu. This Roti is made with grated pumpkin, spices, Ragi flour and wheat flour. I had something else planned for this letter but later on realized that I have not used Ragi flour in this series and that I felt was gross injustice to the healthy flour. So last minute change of plans made this roti happen. I am sure I will be making this nutritious roti often. In a mixing bowl, Add Ragi flour (for some reason I dry roasted the flour), wheat flour, grated pumpkin, chopped coriander leaves, salt, red chili powder, ajwain and mix well. Since the pumpkin will release some moisture, take care not to add too much water to knead into a soft dough. Divide the dough into 5 equal portions, roll out into 5 inch thin discs using as much dry flour as needed for dusting. Gently transfer the rolled out disc onto a hot griddle. Flip it when there are bubbles visible. Spray some oil and cook on both sides until done. Remove onto an insulated container and continue with the rest of the dough. Serve with Yogurt for a filling meal. For the letter X, I have taken an exception and redefined the spelling of 'Extra' to accommodate the letter 'X'. Whatever the name / spelling might be, this cheesy paratha which was pizza like in taste was one of the popular parathas at home in this series. Two more letters to go to finish this series. Keep guessing as to what the flatbreads might be with the letters Y and Z.
Knead the dough in a mixing bowl by adding wheat flour, salt, oil and water. Cover and set aside for 20-30 minutes. Pinch 6 equal portions of the dough. roll them out into 5 inch discs. Cover and set aside until ready to shallow fry. For the filling - In a bowl, add the chopped vegetables, sprinkle salt and red chili powder. Mix well and set aside. To assemble the paratha - On a rolled disc, place the vegetable filling in the center. Top it with shredded cheese. Wet the edges and cover it with another rolled disc on top. Make sure there are no air pockets trapped before sealing the discs. Crimp the edges using a fork. Gently transfer this onto a hot griddle and cook on low flame so that all the filling and both the discs are evenly cooked. grease the Parathas as needed on both sides and cook evenly on both sides. Remove onto a serving plate and continue with the rest of the rolled discs. Serve as is or with Yogurt or Marinara sauce. Warqi Paratha is a rich, flaky, layered paratha which tastes amazing with any spicy gravy. The layers are filled with clarified butter(ghee) and shallow fried in ghee as well. It definitely fits into the Nawabi or Mughalai cuisines. Though it is traditionally prepared with All purpose flour, I have opted to make them with whole wheat flour. In the process of relearning the English alphabet, we have almost come to the end. For today, it is W for Warqi Paratha. In a mixing bowl, add the wheat flour, salt, ajwain and a teaspoon of ghee. Mix well. Add warm water gradually to knead into a soft dough. Cover and set aside for 20-30 minutes. Make two portions of the dough. a.Roll the one portion into an 8 inch disc. Brush ghee evenly on the rolled out disc. Fold one side of the disc to the middle, spread some ghee and then fold the other side to the end. It would resemble a rectangle. 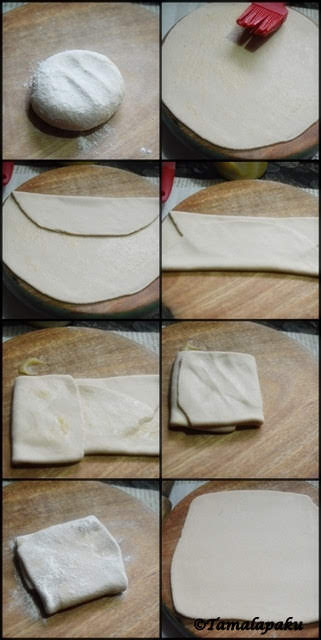 b. Pat some ghee all over and fold the rectangle to the middle and fold from the other end to cover the first fold. Repeat steps a and b 3-4 times. The resultant paratha would have about 16-20 layers with ghee smeared in every layer. Heat a griddle and carefully transfer the rolled out paratha onto it. After a few bubbles appear, flip the paratha and generously smear ghee. Allow the under side to cook and then make sure ghee is smeared on both sides and is well cooked. Remove and continue with the other portion of the dough. Slice and Serve warm with a spicy accompaniment. Moving on to the next letter, V, I have chosen to showcase a healthier version of Mangalore Buns. Made with overripe bananas, yogurt and whole wheat flour, these flatbreads are healthy and a delight to have for any meal of the day. These parathas turned out to be very soft and mildly sweet with a hint of the bananas. My little one enjoyed with Nutella :). In a mixing bowl, mash the overripe banana. Add in yogurt, besan, sugar, cumin seeds, pepper and salt. Whisk them together. Add in the flour and baking soda and gradually knead to make a soft dough. Ensure that no water is added and if the dough needs more moisture add yogurt little by little. Cover the dough and set aside for a few hours or overnight to ferment. After the dough has fermented, the dough tends to get softer, so add a little more dry wheat flour and knead until it is manageable. Divide the dough into 6-7 portions. Roll each portion out separately into 4-5 inch discs. Gently transfer the disc onto a heated griddle and cook on both sides greasing them as needed until they have golden brown spots all over and have cooked through. Serve with a curry of your choice. As we are nearing the end of this series, the difficult letters are coming upon us. For the letter U, I chose to do Upwas Puran Poli. 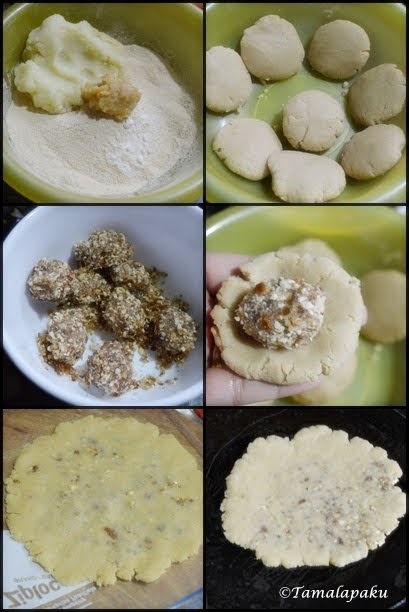 This version has dates and nuts as a filling and the outer layer of rajgira flour(amaranth flour) and mashed potatoes. This was one of the toughest flatbreads I have ever attempted. First, the dough wouldn't come together as it is a gluten free flour. Even upon adding mashed potatoes, it was very tough to manage it. Second, the rolling was very difficult as it was falling apart. So I had to use greased sheets, a combination of patting down and using the rolling pin and then fixing all the cracks with greased fingers. The first one took a long time as I had to figure out the best way to make it all stay together. Also this was my first time working with Rajgira flour. The flavor and texture are all new to me. The earthy, nutty smell and taste of the Rajgira flour needs some getting used to. Pulse the dates, almonds, cardamom powder and cashews together until they form a stiff mixture. Make 8 equal portions and set aside. In a mixing bowl, add rajgira flour, mashed potatoes and ghee. Gradually add milk/water as needed to knead into a pliable dough. Make 8 equal portions and knead each of them separately so there are no cracks. 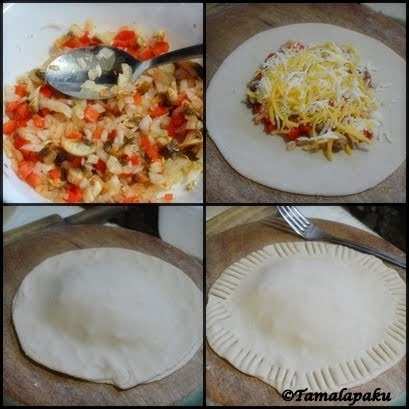 Take one portion at a time, flatten it slightly and put in the filling portion, gather the edges and using a greased plastic sheet pat down with your fingers until the dough resembles a thin disc. Transfer the disc onto a heated griddle and cook on one side. After the underside is cooked, flip it carefully, spread some ghee and cook the other side. Remove and continue with the rest of the portions of dough. Starting the last week of this series with the letter T for Thalipeeth. Thalipeeth is a traditional Maharashtrian flatbread with a unique blend of grains. The recipe calls for 6 kinds of whole grains and legumes. I am able to source them but have no means of milling them. So I asked for alternatives and was told the flours can work well but they need to be dry roasted to get a near close taste of the traditional Bhajaniche Thalipeeth. Bhajaniche means roasted. The resultant flatbread felt like the Sarvapindi which we make with just rice flour, just that the earthy flavors of jowar and bajra were dominant in this thalipeeth. Traditionally all the ingredients for the Bhajani are dry roasted and milled. Alternatively the flours can be dry roasted and used for the thalipeeth. In a mixing bowl, add the dry roasted flours, mix in salt, chili powder, hing and turmeric as needed. Add oil and mix well until it resembles bread crumbs. Add in finely chopped onions and coriander leaves. Add warm water to knead a soft dough. 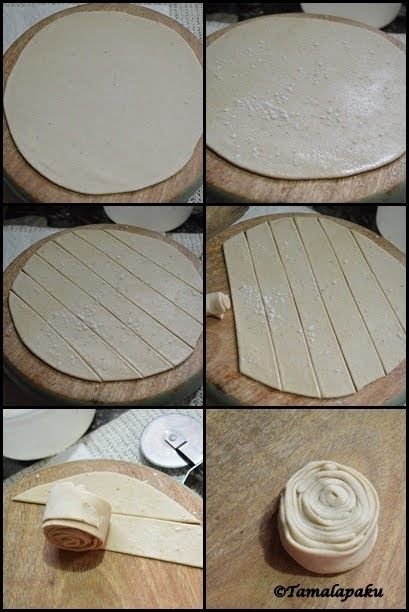 Make about 7-8 equal portions of the dough and roll them into thin discs between greased sheets of plastic. The dough can be patted down on a greased sheet to about 4 inches in diameter. Make a small perforation in the middle of the disc before gently transferring it onto the hot griddle. Spray oil in the perforation and around the disc, cover and allow it to cook. When the steam starts to sizzle, remove the cover and flip the thalipeeth. Allow it to cook the other side as well. Serve warm with just butter, or yogurt or any pickle. Satpuro Phulko appears in a typical Sindhi breakfast platter. It is a flaky flatbread made with wheat flour and which is rolled multiple times and cooked on a hot griddle to get a crispy paratha. 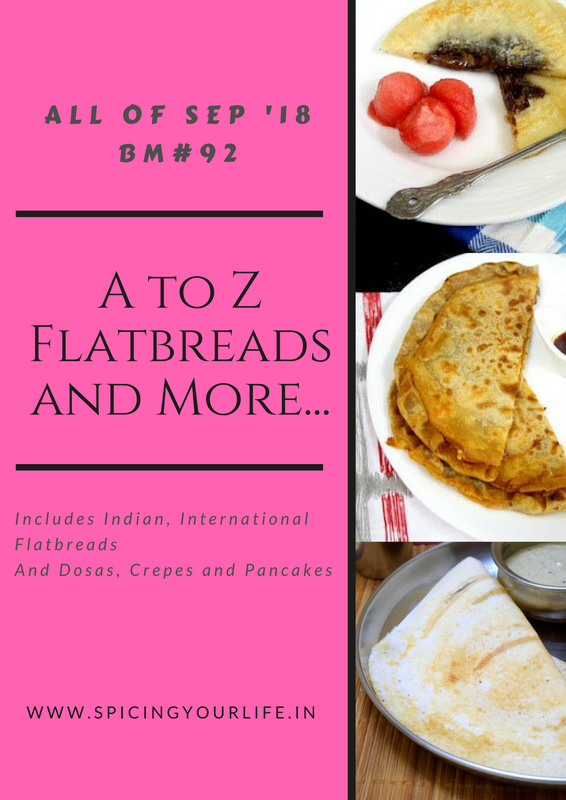 There are so many different types of layered flatbreads from different parts of India but each of them has a unique way of creating the layers. These Satpuro Phulko also have a unique way of rolling. With today's post, we come to an end of yet another week of 'Flatbreads and more'. We will take a break for Sunday and get back on monday for the last week with letters T through Z. In a mixing bowl, add the flour, salt, pepper and a teaspoon of oil. Gradually add water and knead a soft dough. Cover and set aside for a few minutes. Divide the dough into 5-6 equal portions. Take each portion, roll out into a 5-6 inch thin disc. Spread oil evenly on the disc and sprinkle some dry flour. Using a sharp knife or a pizza cutter, cut vertical strips about 1 inch apart. Tuck the edges and roll out into slightly thicker discs using as much dusting flour as needed. Gently place the rolled disc on a hot griddle and allow to cook. After a few bubbles appear, flip the paratha and drizzle oil as needed. Ensure both the sides are well greased and cooked thoroughly. Serve hot with a spicy accompaniment. 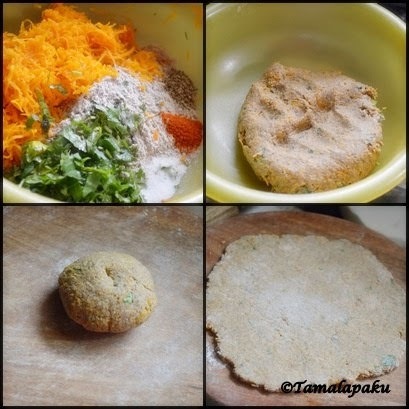 Radha Vallabhi is a traditional Bengali style Dal Stuffed Puri. Many Bengalis start their day with these delicious treats. The stuffing varies from family to family. Sometimes they are stuffed with Urad Dal and other times they are stuffed with Chana Dal along with spices. I felt they are similar to the Bedmi Puris with slightly different spices. These are often served in temples as well. So R for the traditional Bengali Puris, RadhaVallabhi or Radha Ballabhi. In a mixing bowl, add the flour and salt. Rub in the ghee/oil until the flour resembles bread crumbs. Slowly add water and knead to a soft dough. Grind the soaked and drained Chana Dal, ginger and green chili adding as little water as needed, into a a fine batter. In a heated pan, add oil, fennel seeds and asafotida. Add in the ground chana dal batter and cook while constantly stirring it. Ensure that the mixture is dry. Add in salt and Bhaja Masala, mix well and remove from heat. After the mixture is cool enough to touch, make 6 equal portions and set aside. Pinch 6 equal portions of the dough and roll them into smooth portions. 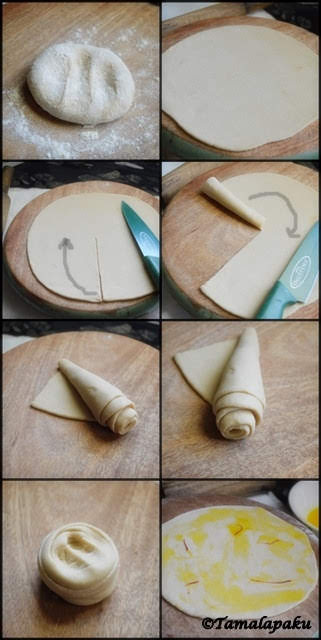 Take one portion at a time, latten with your fingers, press in the filling, close the edges and roll into thin discs. Heat oil in a pan and gently slide the disc and fry on both sides until they are golden brown and puff out slightly. Remove onto paper towels and continue with the rest of the dough. Serve warm with any spicy accompaniment.